CANNES, France—After the unprecedented success of investigative podcast Serial, one might think potential sponsors would be lining up in droves to get involved with the show. But public radio icon Ira Glass, one of the driving forces behind the addictive audio series, says there's still a lack of awareness among brands about the past year's tremendous surge in popularity for podcasts. More importantly, he says, potential advertisers don't seem to realize that podcast sponsorships can be tremendously effective for business, generating some of the best brand recall of any ad option today. So this week, he and the creators of Serial will be taking their quest for more sponsors into the thrumming hub of global advertising itself, the Cannes Lions. In addition to Friday's Cannes session featuring Serial host Sarah Koenig, co-creator Julie Snyder and producer Dana Chivvis (moderated by panel sponsor McKinney's CCO Jonathan Cude), Glass will be milling around the festival all week to rally sponsor support for shows like This American Life and a few other podcast projects in the works. Adweek: Are you going to be presenting on stage at Cannes with Sarah Koenig and the Serial team? 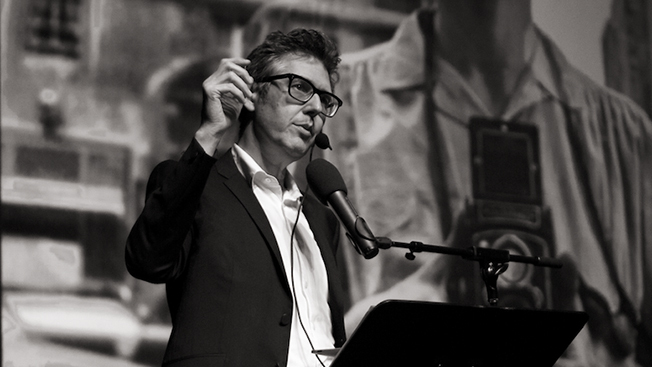 Ira Glass: No, I won't. You're just going as support? I'm going really on a similar mission as they are. Both they and I feel we're in a situation where we're looking for brand partners. Serial is the most popular podcast anyone's ever made, with 7 million people downloading each episode. But in most normal weeks, This American Life is the biggest podcast out there if you look at iTunes. Most days, we are the No. 1 podcast, and that's been true for years. We're looking at starting new shows and new podcasts in the coming years, and it seems like it'd be a good chance to meet people who might want to be our partners as we do that. It seems like it's a very finite pool of brands and startups that really put money into supporting podcasts. This is exactly our thinking, actually. You hear the same brands over and over. Those brands, honestly, have been great—and great to work with. But we wonder why aren't these bigger national brands discovering this yet? The news has yet to hit a lot of people of how large podcasting has gotten, and even just in the past year, how much it's changed. I think there are still CMOs who haven't heard that there are podcasts getting audiences of 7 million people. When we do surveys of those people, people have incredible recall of the brands that are being named on the podcasts. It also tends to be a more affluent audience and very desireable. So I feel like the job is on us to get the word out there, and that's why I'm going to Cannes. It feels like people are waiting for the next Serial, for the next proof of concept that this isn't just a one-off success. What's been your perspective of this past year? It's been an exciting year. Honestly, though, there have been shows since Serial that have done amazingly well. Invisibilia, which NPR produced, had something like 5 million downloads per episode in the first month it was out. There's a company called Gimlet Media, which is our former colleagues here at This American Life who started a for-profit company to make podcasts. They've put out three shows now, and they're great. I feel like it's slowly climbing. We feel like podcasting can be TV. It really can. But still there aren't that many people making things at the quality of great TV. I feel like that's going to slowly come up in terms of audience numbers, in terms of where it can go. Last fall, two things happened. One was technological: The iPhone put a podcasting app on the home screen as part of every iPhone people buy. So for the first time, people weren't asking: "How do I get these things? What do I have to do?" It suddenly became, "I push this button, I can see what the Top 10 podcasts are." Suddenly it became way easier. There was the jump in numbers the Edison Group saw, from 14 percent to 17 percent of all Americans having listened to a podcast now. That's just going to keep climbing. So part of it was technological, and then part of it really was Serial. After Serial, all the big podcasts experienced a jump. I know for This American Life, we gained hundreds of thousands of people in the wake of Serial's success. Serial was such a phenomenon and got so many people listening to podcasts who hadn't listened before. What's it like for you, as someone who spent your career in public radio journalism, to see it suddenly being held aloft on this international stage as something everyone should look at?